Ceratholasma tricantha is the sole member of its genus, distributed along a narrow strip of coastal Redwood forest in northern California and all of Oregon. Characteristics are the three name-giving horn-like processes, two on the front of the prosoma and one on the eye hill, as a unit shielding the chelicerae. These animals are very colorful but well camouflaged in their environment. 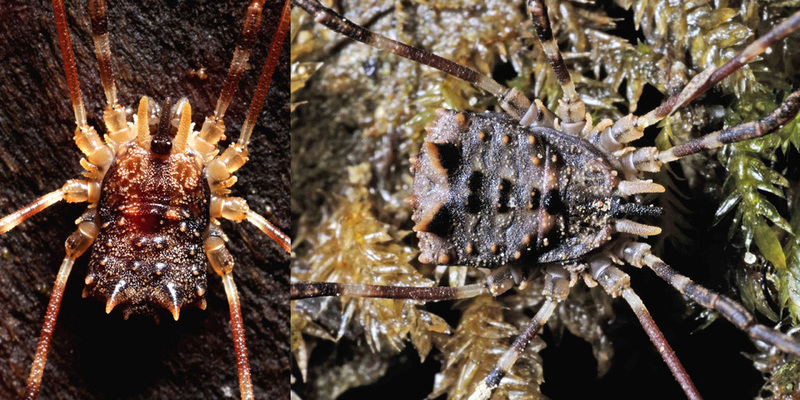 Despite its unmistakable appearance, the species is unique within harvestmen for having a stridulatory system combining structures on the palps and chelicerae. Genital morphology is rather simple (Gruber 1978). Closest relatives seem to be Ischyropsalis (Martens 1969, Gruber 1969) and Acuclavella (Shear 1986) based on sternal morphology and other morphological characters. Acuclavella is presumed to be the close sister genus of Ceratolasma. The long terminal process on the eye hill, the form of the cheliceral apophyses in males and the relatively simple and similar penes are shared between both genera and both occur in geographic proximity (Shear 1986). Gruber (1978) re-described Ceratolasma and mentioned some intraspecific morphological variation maybe worth investigating if indicative of cryptic speciation. Ceratolasma lives in rather humid to moist habitats, often associated with the Redwood forest belt and riverine forest strips within. Animals are most frequently found under logs. A tendency to avoid deep humus and litter and preference of more stable, loamy soils is perceived from personal observation. Goodnight, C. J. and M. L. Goodnight. 1942. New American Phalangida. American Museum Novitates 1164:1-4. Gruber, J. 1969. Über Stridulationsorgane bei einem Ischyropsalididen: Ceratolasma tricantha Goodnight & Goodnight (Opiliones, Arachnida). Anzeiger der mathematisch-naturwissenschaftlichen Klasse der Österreichischen Akademie der Wissenschaften 105(11):249-255. Gruber, J. 1978. Redescription of Ceratolasma tricantha Goodnight and Goodnight, with notes on the family Ischyropsalidae (Opiliones, Palpatores). The Journal of Arachnology 6(2):105-124. Shear, W.A. 1986. A cladistic analysis of the opilionid superfamily Ischyropsalidoidea, with descriptions of the new family Ceratolasmatidae, the new genus Acuclavella, and four new species. American Museum Novitates 2844:1-29.